A Deal With The Devil – A Sinful Devil And Immature Girl! Another first for me reading Louisa George and her international bad boy Rex Doyle is trying to go on the path of the good. Surviving an abused childhood, he becomes an ultra savvy and successful businessman owing casinos. Ex-fighter and wanting to leave that life behind, he works hard, plays hard and is an alpha with a big heart. Kate has lost a lot in life, and she seems to have lost herself to avenging her brother’s current situation, and the author lost Kate’s character somewhere along the story. I unfortunately could not relate to Kate and her predicament. The plot was too thin and the build-up lacked interest. Rex had more background and development and he turned out really well. Kate on the other hand, just did not have enough grout to match Rex. 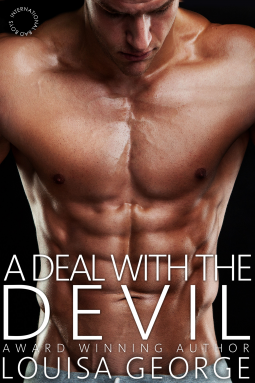 ‘A Deal With The Devil’ is a short novella that can be read once. Although it held interest for me because of Rex, and of course the presentation and narration was pretty good, it just lacked the oomph and pizzaz of the female character.